Is social media marketing really worth all the effort? Is there a payback? Or are we all just wasting our time and money? These are not questions to be taken lightly and I’m sure that there are social media experts that will have a strong view based on all manner of empirical evidence. At GSA, we do use Social Media. We religiously post content on LinkedIn, Twitter, Google+, Facebook and YouTube. That’s the core of what we distribute. Why do we do this? Does it actually work? These are questions we have asked ourselves and the reality is that, for us, social media doesn’t deliver large numbers of visitors to our website. However, I did a couple of presentations recently to audience of local business people where I spoke about how our world has changed. No, I’m not talking about Brexit this time. I’m talking about the way we communicate. You can check out the PowerPoint recording of the presentation here. The point is that the world is changing fast. 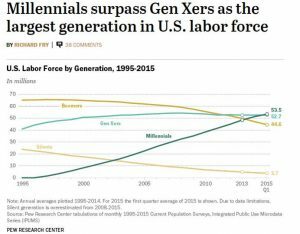 Millennials number not far short of 50% of the population. That’s people in business who know nothing before the internet and use social media all the time. 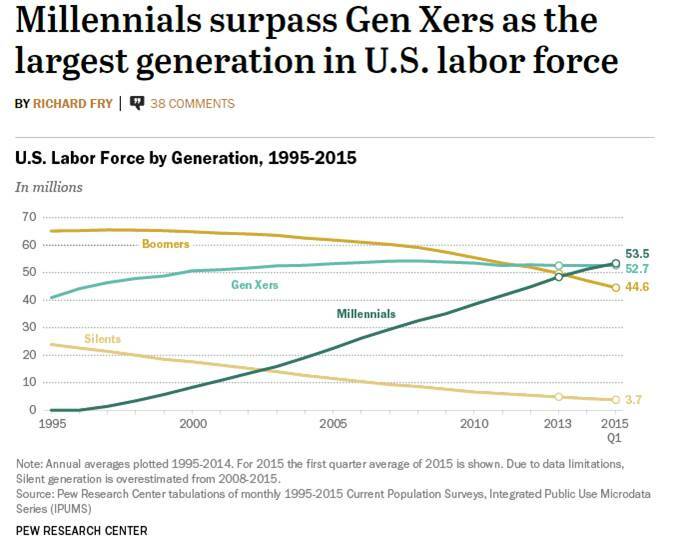 Not only are Millennials growing in importance in the workplace, there are tomorrow’s consumers, both of goods and services. 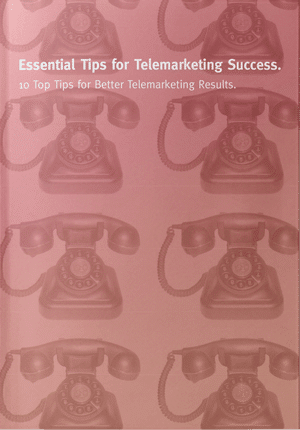 Doesn’t it make sense therefore, to consider how best to reach them in a marketing sense? A survey by Ipsos MediaCT/Crowdtop in 2014, found that Millennials spend up to 18 hours each day ‘consuming media’. Of course, the term ‘media’ covers a lot of ground. As it happens, in this context, it includes TV, radio and email so this is not just about ‘social media’. But, take a look at the chart below. They spend a significant amount of time on social networking sites and reading blogs and other content. 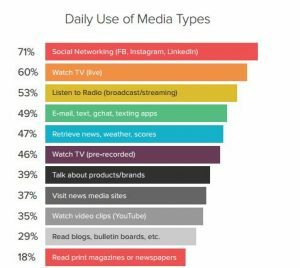 What’s also interesting to note is that another survey found that 30% of their daily media consumption goes to content produced by their peers. That means user-generated content. What does this all mean to us? In my humble opinion, it means nothing unless you consider other factors. Clearly, we all like to read and watch interesting stuff. That’s why YouTube has currently, 6 billion hours of video watched on YouTube per month & 1 billion videos watched over mobile phones per day. While the Brexit debate was raging, what sources did you use to find info and assess the mood? If you’re anything like me, some of your insight came from the news on TV. Some came from newspapers. However, a lot came from social media sources whether that was via an article or video shared on Facebook or the Brexit hashtag on Twitter or via a status update on LinkedIn. The fact is that social media is interwoven in our daily lives for both business and pleasure. And, given simple demographics, this is likely to grow not decline. Therefore, it’s no longer about whether you should get involved. It’s more about how. It’s about understanding that your customers and prospects are looking for information, knowledge, entertainment, communication and engagement through the channel of social media. It’s therefore about how you and your business connect with them while they are in that mode. It’s all about relevance. It’s not about overt selling. Whilst LinkedIn may be a business network, even there, it’s more about provision and insight than it is about pitching. We share things that we think our peers will find interesting. Don’t forget that if you’re providing useful facts and figures that other will welcome, Google and the other search engines favour websites that have frequently updated content. And, more and more, social presence is and will be taken into account in search. So, is social media a quick win? To some extent, it depends on how much content you generate, how quickly and frequently you release it to your networks and how compelling it is. Success is also determined by the size of your network. If you’re speaking to 50 people, that’s not the same as sharing your content with 5000 relevant individuals. Hence, you need to extend your peer network for social to work for you. That doesn’t mean anyone and everyone or buying Twitter followers. 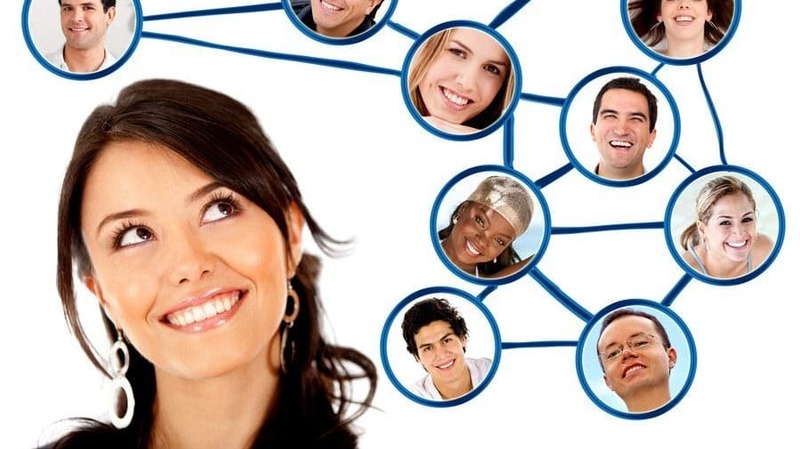 It’s about growing your network organically. You need to engage with like-minded people that can carry your message to others. It’s down to reach. Successful companies in social media have been doing this for some time. Big companies have legions of marketers working on social and content. They employ external agencies to do legwork. Some smaller companies have mastered the art by jumping on the bandwagon early and showcasing their knowledge on the relevant networks for their target audience. That could be Pinterest, Instagram and Facebook where the audience and services are visual and younger although Facebook isn’t only the domain of the young. Others have amassed very large followings on Facebook. The crazy thing is that nowadays we all have a channel and we’re all broadcasters and media owners. How could the following have taken place if that weren’t the case? Check out the number of subscribers and followers. ny cats and dogs. We are increasingly conditioned to finding out information in ways that would have seemed absurd 10 years ago. So, generating genuinely compelling content is the priority. You can’t employ old marketing and sales tactics for social media. And, you have to commit to the process. We liken it to the American Football philosophy of Offence vs defence. Is social media a tactic that’s going to win you more sales immediately? The answer is probably not since you need to allow it time to build and you need sufficient momentum and traction and for enough people to get to know you, follow you and share your posts. In our book, this is, in part a defensive tactic. Fast forward a few years and maybe sooner. With a predominance of millennials in the workforce, how will they relate to your business in the years to come? Will they even be able to find you? And if they do or you find them, will they be impressed with what they find, especially compared to your competitors? No doubt, time will tell whether social media is ultimately a fad and whether something else comes along to take its place. For our business, it has proven extremely successful and we’ve won some tremendous new clients through the inbound leads our activity has generated. That can only be put down to our efforts in content marketing and social media marketing. So, is social media really worth all the effort? For many businesses that have been doing it for some time, it most certainly is. If you’d like to find out how GSA Business Development can help Generate Growth for your Business, contact us now on 0845 658 8192 or send us an email.